DOWNTOWN SCULPTURE PARK "TEST FIT"
Serving as the front porch to the city, this concept for an iconic sculpture park serves as the catalyst for future development and a visible platform for both performance and education. The primary ambition for the Sculpture Park is to extend downtown’s vibrant and visual performing arts and cultural venues into one stimulating, multi-functional park space. The park sits above the street on top of an 860-space parking structure, allowing for a distraction free experience and offers an opportunity to embed performance, art, and culture into the public realm. The richness and diversity of the Park make it a must-see destination for citizens and visitors alike. Programmed to support varying scales of gatherings and a wide range of visual and performance arts, the Park is designed for curated art, and sculpture exhibitions, large concerts and cultural events, art-making and performance spaces. Comprised of three components, “The Dancers,” Pocket Park, and the “Green Ramp,” this park will be designed with a grand sloping lawn designed to include integrated steps and seating elements that physically invite the visitor or motorist to peak into the park. Will extend the character of live performance and active use to the outdoors. Capable of handling large crowds of up to 3,500 patrons, as well as family picnics, the lawn provides a welcome respite at the center of downtown. Within the grove there will be public art displays as well as art benches. All tree canopies will be up lit from below. The space, as an overlook to “The Dancers,” is to be a discovery space in the sequence of outdoor spatial “scenes.” This quiet, hardscaped area is for very intimate performances, shows, and smaller gatherings. This is a large, flexible event space that is nearly one acre in size. The hardscape surface is identified with a checkered harlequin patterned derived from the English Harlequin character. 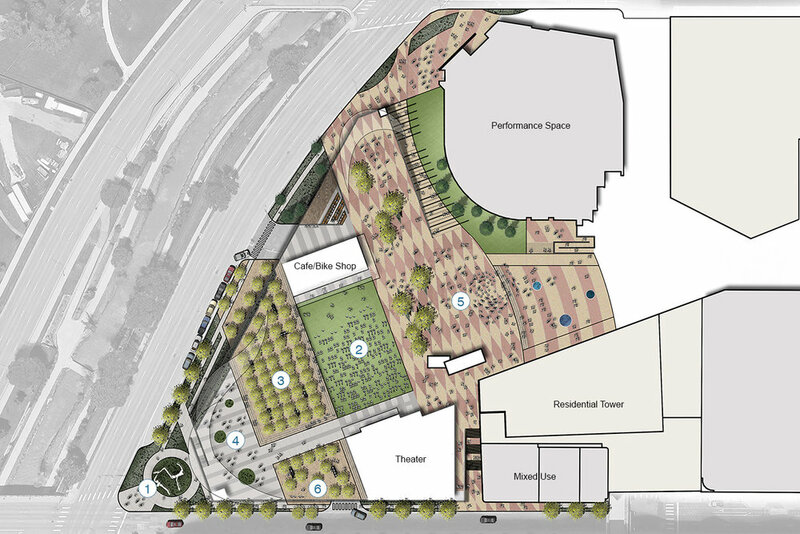 Interrupted with planters filled with trees, ornamental plantings, and rotating pieces of public art, the Plaza will accommodate a vast array of varying sized events. As the physical and digital worlds become one, the Pop-up Park is intended to provide a playful experience for visitors to Sculpture Park. Ample open space with unobstructed views will allow for a variety of pop-up features. Movable site furnishings and permanent light fixtures mounted on Smart Poles will allow for a variety of pop-up features.